Durango’s Benji Mickel skates past Telluride’s Riley Stack during Sunday’s youth hockey games at Chapman Hill Ice Rink. Mickel had a pair of points in the Pee Wees’ two-game sweep on their home ice. 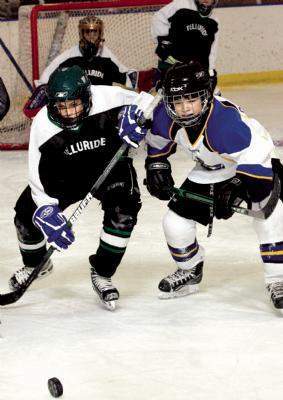 Last year's state-championship Squirts are this year's Pee Wees. They're still winning games, too. 4-1 in Game 1 and 5-0 in Game 2. Telluride tied it at 1, then Durango scored three unanswered goals in the third. Collin Thorburn made 10 of 11 saves for the victory. (Stowers, Kele Steffler) scored less than a minute apart at the end of the period to complete the scoring. Thorburn made four saves in the shutout. Durango will play Grand Junction and Kremmling on Jan. 23-24 in the Grand Valley. Durango went 6-for-6 to win a tournament championship Dec. 19-20 in Gunnison. The Mites, 6 to 8 years old, won their final three games by an aggregate score of 26-9. Durango defeated Pueblo 12-3, Telluride 6-3 and Crested Butte 8-3 to finish its unbeaten run in the tournament. Jax Bayer made 21 saves in goal for the win. Kidd scored a hat trick against Telluride, and Robinette, Sakadinsky and Wolverton scored one each. Kidd and Sakadinsky had a hat trick against Crested Butte, and Woolverton scored two. Durango will play at 12:45 p.m. and 6:15 p.m. Saturday and 8:45 a.m. Sunday.